Album Info: Subway, PCC, CLRV, and Peter Witt Transit Vehicles. 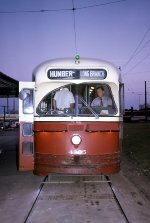 Description: Westbound on Queen Street E.
Description: Queen car at Humber Loop. Description: Keele Loop shot 1 of 2. Description: Keele Loop shot 2 of 2. Description: On King Street West. Description: On King Street W.
Description: King Street at Yonge. Description: On Carlton Street, Downtown. Description: Bathurst near King Street. Description: Dundas West near Bay Street on a cold, snow, miserable day. Description: King Street East on an icy cold day. Description: Dundas Street near Bay Street. Description: Near Dundas West Station. Description: On Long Branch Loop. Description: At Dundas West Station. Description: Queen Street W. near Yonge Street. Description: Queen Street, Downtown Toronto.